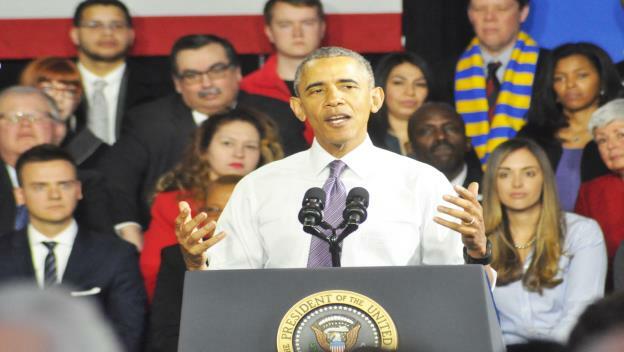 President Barack Obama paid a visit to Milwaukee on Thursday, March 3, 2016. President Obama appeared at the Bruce Guadalupe Community School in order to congratulate the city of Milwaukee on winning the “Healthy Communities Challenge.” The “Challenge” was a competition issued by the White House among 20 communities across the U.S. that had high numbers or percentages of Marketplace-eligible uninsured. Under the leadership of Mayor Tom Barrett, County Executive Chris Abele, and a number of community based organizations and initiatives, about 38,000 people in the Milwaukee area selected a plan through the Health Insurance Marketplace, putting Milwaukee in first place in the competition. Together with returning consumers, about 89,000 individuals and families in Milwaukee had insurance through the Marketplace in 2016. President Obama also met with families and individuals who have had, or would have had, a difficult time finding affordable health insurance or any insurance at all if not for the Affordable Care Act.